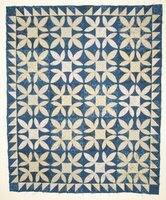 Petals & Feathers No 153 - one of the new patterns for little wall appliqués - it would be quite a stretch to call them quilts! LOL so for the lack of anything better I think "wall appliqués" is a good description. Two are 8" x 10" and the flower pot is 9" x 11". They were sooooo much fun to stitch - I love handwork - stitching little projects like this. Easy to take a long or to work on in front of the TV. I will do a little quilting on them then finish with binding. They would also be nice in frames or could be used for a journal cover. I hope you like them too. 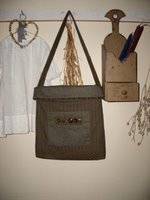 They were made with the new Chocolat fabrics from Moda. 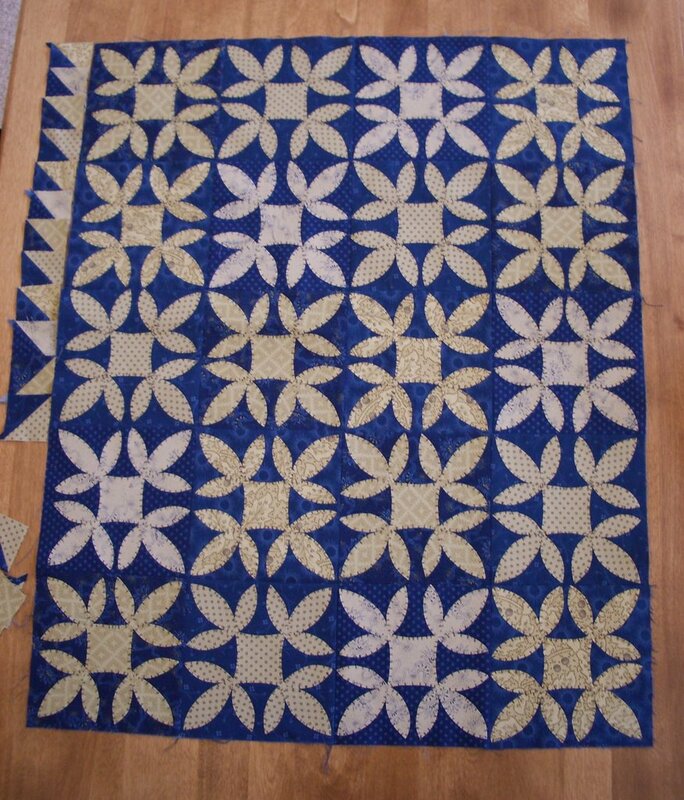 Several people have emailed me asking about the "quick wash" I noted in my last post for the Pinwheel quilt (now named Pieced Pinwheels No 151) - so here is a little more on that. I haven't prewashed my quilt fabrics for years since I always use quilt shop high quality fabrics. My favorite batting is Mountain Mist Blue Ribbon Cotton Batting - a perfect thin batting for my small quilts. I wash my little quilts in the washing machine (warm water/cool rinse/shortest gentle cycle) when they are finished - quilted with binding. I dry them with air only for a few minutes and lay them flat on the carpet in a spare bedroom to finish drying. If there is any concern about a fabric bleeding I test that fabric in a cup of hot water to see if any dye shows up in the water. 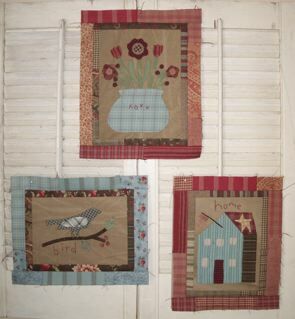 The fabrics I used for Pieced Pinwheels are from Baum Textiles Farmhouse Blues. Ta Da! The new pinwheel quilt is done! Binding stitched and now it is ready for a quick wash to shrink the batting and make it look old. Any ideas for a pattern name? Pinwheel just doesn't do it for me but that is all I have right now. As soon as I find some time I am going to list some pattern and workshop models on ebay. After rearranging the studio and shipping room I need to make room for other things. 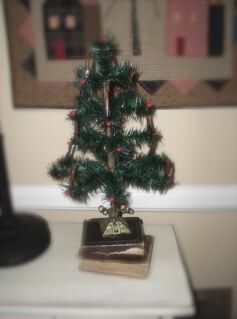 It occurred to me that some of you reading my blog might be interested in them so I will post a link to the listing. Back to stitching! New Quilts . . . ready for sewing on the binding. This is just a teaser since they are folded up to hide the raw edges. I used this photo for my new ad in American Quilt Retailer the very best trade magazine for quilt shops. Thank you Susan! The New Handbag . 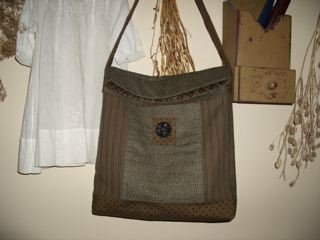 . . still working on it to tweak it a bit and then I will make two in the pattern cover fabrics - one for the front view and one for the back view. This bag has been torn apart so many times already but I love these old fabrics so I will keep this one to carry! Tomorrow I will take photos of the two quilts I picked up today from Sandy - she did a fabulous job on the quilting as usual - she really is the BEST! I feel very fortunate to have her quilt for me especially because she fits my quilts into her busy schedule. Thank you Sandy! This is the beginning of the trail I hike - it is finally getting cool enough to hike again . . . at least if you go really early. The trail is 1 3/4 miles long and then you come back on the same path making it a 3 1/2 mile hike - plenty of exercise for me! 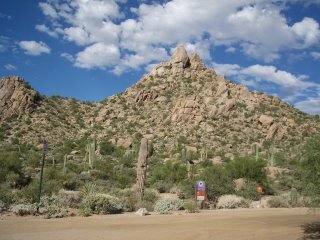 Next time I will try to remember to take my camera on the hike and post some photos of how beautiful the views are. Back to stitching! YAY! 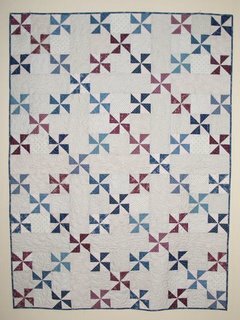 This one is ready to be quilted and here is a peak at "Pinwheels" too. I knew that red and black numbered tape would come in handy - you can see the little red pieces of tape on the blocks and the black tape is on the cornerstones to mark placement. See it pays to be a collector of many things. The blocks are pinned together with the pinwheel cornerstones . . . the sashing/connecting fabric may be here today. The plan is to finish this top today or tomorrow! 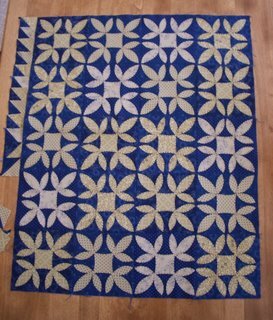 Finally enough done to take a photo - this is one of the new quilts ready to add the border. 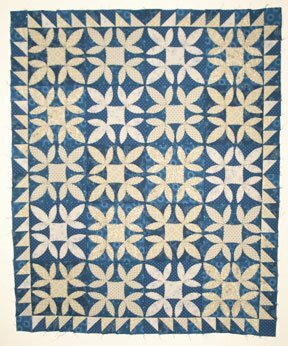 It is amazing what a pieced border does for little quilts. 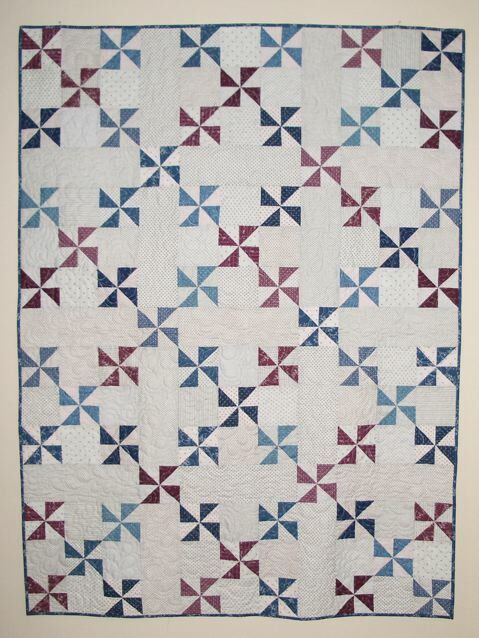 In fact I love pieced borders on most quilts. This one may be called "Batter Bowl" unless I can think of a better name - any ideas? Hopefully by tomorrow this one will be ready for my very wonderful long arm quilter, Sandy. Another one should be ready soon to sew together then take a photo to post. Back to stitching! I LOVE IT! Thank you Laura and Rita! Their shop is in Hiawassee, Georgia - I haven't been there but if I ever get to Georgia it will be at the top of my list for places to visit. Even if you are not a quilter I bet they have lots of really neat stuff to see. They are darling ladies! Here are a few old sewing treasures - I love to hunt for them at flea markets and antique shops. How about you? It is fun to think about the ladies that bought them originally and imagine what their lives were like. 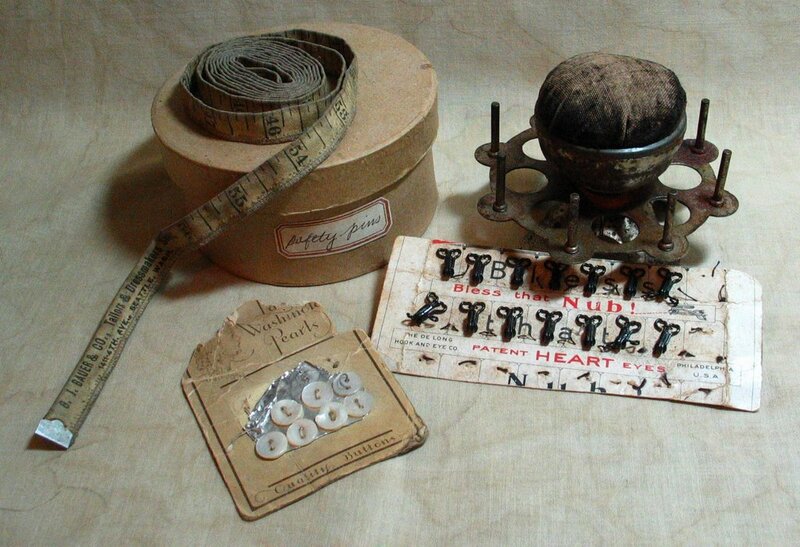 We are so lucky to have all the sewing tools that are made today. What would we do without our rotary cutters and mats? 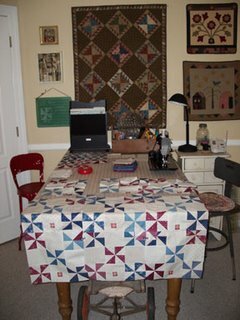 It sure makes sewing quilts a whole lot easier - don't you think? When I have trouble picking from the many beautiful fabrics available today I remember that some of the vintage quilt charm is the "make do" use of fabrics. I hope to post a photo of at least one of the new quilts I am working on tomorrow.